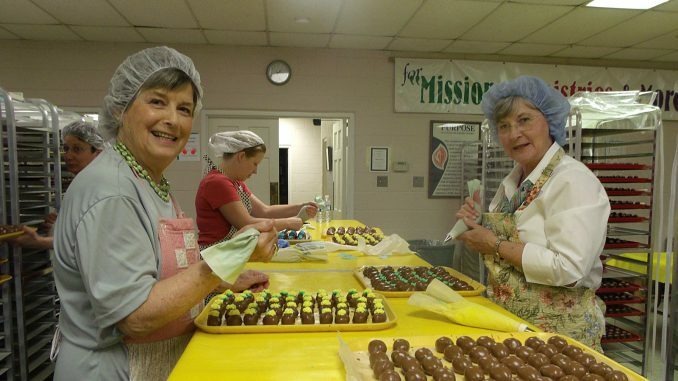 Since 1979, the 145-year-old Beech Grove United Methodist Church in Suffolk has sold chocolate-covered eggs as a money-raiser. This successful project is managed by Carole and Mac Clarke, now in their 80s. “It’s a lot of work,” says Carole, “but it is also lots of fun.” Volunteers do all of the work. “We have as many as 75 helpers. They aren’t all church members. Some of our customers have become volunteers. Some stay a few hours. Some stay all day,” she says. When the project began, the original church kitchen was used. There was no special equipment. “Over the years we have added larger appliances. Many useful items have been donated. The first item was a large mixer we received from a school, and it is still in use,” says Carole. The kitchen was recently remodeled with help from egg funds. The candy eggs are available in three sizes: one-ounce, half-pound and one-pound. The one-ounce size is like a piece of candy and is usually sold in 12-packs. Flavors include butter cream, peanut butter, coconut and fruit and nut. The best sellers are butter cream and peanut butter. “My favorite is coconut,” says Carole with a smile. “If I eat an egg, it will be peanut butter,” says Mac. How many eggs are sold? 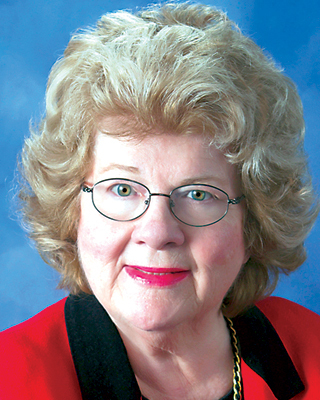 “It isn’t possible to make an accurate count because of the varying sizes,” says Mac. “We measure by the batches.” An average batch is 10 pounds. In 2018, 654 batches were prepared. The amount varies from year to year and has been as high as 859 batches. Mac supervises purchases and carefully maintains quality while negotiating the best price. “Our chocolate comes from California. Last year we bought 82 cases, 25 pounds per case,” says Mac. There were 56 cases (30 pounds each) of sugar and 51 cases of margarine. No milk or flour is used. Income after expenses pays for church improvements, apportionments and missions. “I have done all of the jobs,” says Carole. She develops and improves the recipes. “I also taste. You might say I am ‘quality control,’” she adds. Often she is on the phone all day, taking orders. Mac maintains the equipment, improvising as needed. He has built tables and devices to streamline production. In addition to buying supplies, Mac prints labels and is the problem solver. Eggs may be ordered over the phone or a customer can come by the church and select from the day’s production. “We are not set up for online orders,” says Carole. However, eggs can be shipped all over the U.S. and even the world. “We shipped some eggs to Afghanistan,” says Mac. 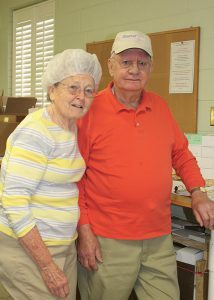 The Clarkes are grateful for all the volunteer help they receive. “No special skill is required,” says Carole. “Just put on an apron, a hair net and gloves and join us! Everyone is friendly. We have a lot of fun and fellowship. We are always looking for decorators. It is the most difficult and tiring job,” she adds. Mac and Carole will be celebrating their 60th wedding anniversary in July. They met on a blind date in college. He attended Virginia Tech and she was at Radford. They are both Virginians. She was born in Dickenson County in southwest Virginia; he was born in Dinwiddie County (Appomattox). Mac had a 55-year career with the Virginia Department of Transportation’s Highway Department. A transfer to the Hampton Roads District brought them to this area. Their two children live in Virginia. “We aren’t travelers; we’re ‘home folks,’” says Carole.